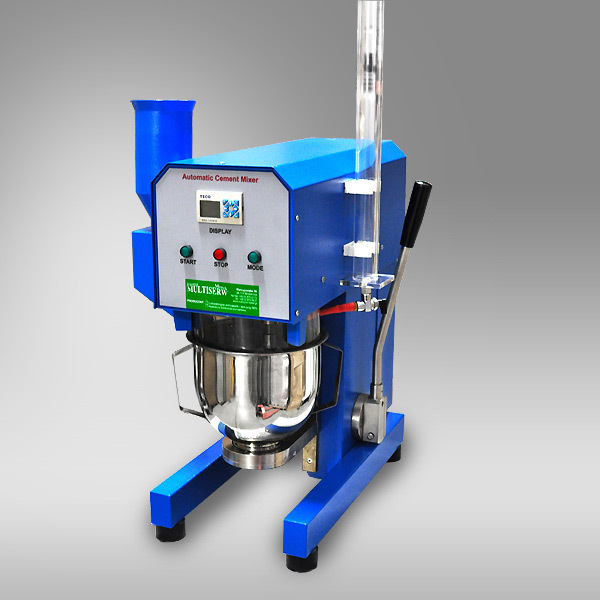 The mixer has been designed to mix mortars and cement pastes primarily to the requirements of standards. The mixing paddle has a planetary motion and is driven by a motor with a microprocessor based speed and preset programs to meet all listed EN and ASTM standards, custom designed programs or manual mode. The mode button is used for the fast selection of different programs. The mixing paddle revolves at a rate of 140 rpm. with a planetary motion of 62 rpm. in low speed. In high speed, the paddle revolves at the rate of 285 rpm. with a planetary motion of 125 rpm. An automatic sand dispenser is supplied withthe machine and the sand is automatically discharged after 30 seconds as per EN 196-1. Custom design allows 6 programs to be set by the operator, where the motor speed, sand dispenser position and duration of the mix can be set. For the mix where the motor speed is selected as zero, the bowl can be lowered without interrupting the rest of the program. On the display the user can see the mix time and the machine is equipped with lamp in order to warn the user for critical time periods.